I was totally amazed when I went to the opening of a new exhibition in Mrs. Wanthip Nimmenhaemin’s Gallery 116 near to the Nawarat Bridge on Charoen Muang Road. Perhaps I should say overwhelmed rather than amazed as this exhibition of works by Thai artists is something very unique and extra-special. There were throngs of people at the opening – almost as if the whole Thai art world was on parade and after a few moments browsing in the gallery it was easy to work out why – the three talented and respected artists whose work is on display provides an exciting contrast of colours, styles and innovation. The opening ceremony was most impressive with light traditional background music and a wonderful display of Thai sword dancing by eight-year-old Theerasut who performed his carefully rehearsed routine very skillfully and enchantingly. Uthai Kanoey is a potter and he has produced some wonderful artifacts in attractive shapes and sizes that would enhance the quality of any home – vases, plates and other fascinating shapes are tastefully displayed around the gallery and add a fabulous contrast to the paintings on display. The colours are intriguing as are the designs – gentle hues of brown or violet with inlaid and carefully crafted patterns that are immediately eye-catching and full of interest. Uthai himself studied for several years in Japan on a Scholarship and he now has a creative factory in nearby Lampang. The other two main artists featured, Sompon Boonruang and Sompaesorn Manorit, have produced beautiful paintings and sketches plus some pictures derived from wood-cuts. Along with the pottery this makes for a marvelous variety of exhibits that is a real feast for the eyes and for the mind. I often find that Thai artists seem quite restricted in their imagination resulting in paintings that are very similar – this is most definitely not the case here. Beautifully coloured and crafted flower paintings are hung alongside stunning frames filled with modern designs in blacks, whites, reds and golds giving an impressive effect. The displays are tastefully arranged as always and in the adjoining annex room are more paintings by students, which are also well worth browsing through. This unique and almost magnetic exhibition is something I am really glad I did not miss – so it is well worth visiting this collection of fine works, lingering around the displays or just sitting on one of the sofas or chairs and absorbing the inherent quality and beauty of all these varied creations. As I wrote earlier, I was quite overwhelmed but also excited by what I saw – so get down to the gallery right away and I am sure you will have a similar experience. All the exhibits on display are for sale at very reasonable prices ranging from 1,000 baht through to larger works around 50,000 baht. 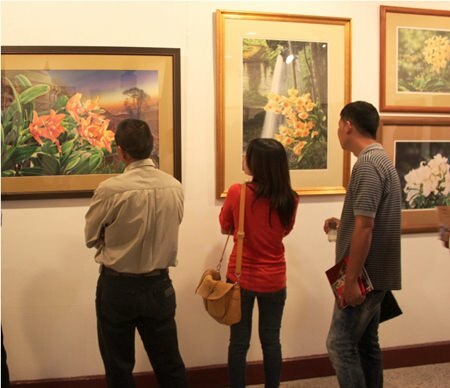 The gallery is situated on Charoen Muang Road about 300 metres from the Nawarat Bridge on the right-hand side heading towards the railway station. It is open from 1.00pm until 7.00pm daily except Monday when the gallery is closed. This is most assuredly an exhibition not to miss before it closes on September 16th. The curator and the gallery can be contacted on 053-302-1110 or on 89 853 2488 or email: [email protected] More information can be found on the website [email protected] For those of you with a blank space on your walls or a coffee table or shelf that is crying out for something to enrich the space, then now is the chance – a golden opportunity – to enhance the beauty of your home and something I am sure would be noticed and admired by any visitors.